"Like" token, awarded by Pine. "Like" token, awarded by Liuxinyu970226. "Doubloon" token, awarded by Dbrant. "Manufacturing Defect?" token, awarded by bearND. "Like" token, awarded by Kelson. We currently treat video and audio content like images, which is not ideal for Flow, mobile and offline dumps. To make this directly useful for page views we might also need to integrate with https://www.mediawiki.org/wiki/Extension:TimedMediaHandler, ideally using client-side JS code. Jdforrester-WMF added subscribers: Alsee, Esanders. T154387 was just closed as a dupe of this because the general issue is being dealt with here, however T154387 is a much more specific bug with much more specific requirements. The issue being resolve here appears to be making sure Parsoid does something useful with [[File:Foo]] when Foo is an audio or video file instead of an image. Solving bug T154387 imposes a constraint making sure Parsoid exactly matches the genuine article view with [[File:Foo]] when Foo is an audio or video file instead of an image. 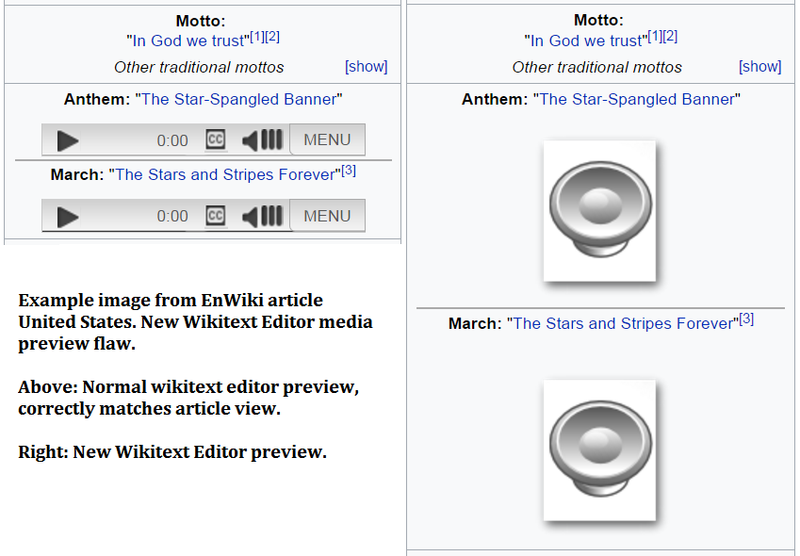 The above image was taken from the EnWiki article for United States. 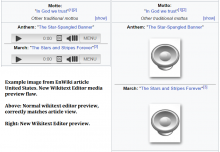 The left half of the image shows the normal wikitext editor previewing the OGG files in the infobox. That preview correctly matches the genuine article view. The right half of the image shows New Wikitext Editor's broken preview of the same area. Incidentally, I assume fixing this bug would make Flow and Visual Editor views slightly less broken as well. I am wondering.. What's the plan here ? It's not clear to me. I haven't seen an update on this from the parsoid team in over a year. I had taken this up for implementation in August/September, but I couldn't devote dedicated time to getting this done. So, I finally handed this over to @Arlolra before the devsummit and he is coming up to speed on this and he will be working on this. And to be fair, it was on my plate before that, but I couldn't get to it. I was actually hoping to touch base on this at the dev summit to make sure we were all still sync'ed up -- but as it turned out, one day of "getting things done" wasn't actually enough. :( Anyway, maybe we should have a brief hangout at some point once @Arlolra has paged in the current state of work to handle any remaining questions/discrepancies. The markup and how parsoid and VE interacts with this markup still has some uncertainties to me personally with regard to T133673: Add width/height attributes to the <audio><video> tag. I'm seriously considering using the <video> tag for audio only players and adding a --data-file- attribute to indicate audio vs video. I'd love to talk over that specific part with the parsoid team at some point, but it's hard to discuss something like this when we are not focusing on this ticket first, so yes, a call at some point when people are up to speed would be wonderful. It would be really helpful for us to get a timeline for the implementation. Thanks for that feedback. @Arlolra has this as the next project on his list (besides regular tasks like quick/high-priority bug fixes, code review, code deploys). Based on previous discussions, it looks like this should be doable by end of March, but I don't want to promise that till @Arlolra has had a chance to look at this a bit more. @Kelson, and that is just parsoid, which doesn't necessarily mean that kiwix will be able to play back the video.. I read that kiwix used to use xulrunner, and i'm not sure that supports video playback in the formats that we support. You should start exploring that in a parallel track. Your target device and environment will all need to be vetted separately ! Arlolra moved this task from Next Up to In Progress on the Parsoid board. Scheduling a call for next week (or, at everyone's convenience) would be fine. which probably means generalizing Parsoid's sync parserTests tools. I'll try and bite that off early next week. And, now that @cscott is back from vacation, let's see about scheduling that call. Pine added a subscriber: Pine. Thanks @brion, still waiting to hear from others. This comment was removed by Kelson. During the week, i'll be only available in CEST (late) evening time. This week, I have time either on the 8th, 9th. Otherwise it's gonna be the 13th, 15th or 16th. It sounds like @brion is busy on Wednesdays, so how about Thursday the 9th at 10am PST (8pm CEST). Unfortunately, I'm going to be away next week. 9th @ 10am PST/8pm CEST works for me. Ok, great, so be it. I scheduled a hangout but if anyone prefers IRC, we could do that instead. Thanks for your time today @brion, @TheDJ, @cscott! Arlolra merged a task: T133669: Add a representation of the thumb time to the A/V thumbnail. Arlolra added subscribers: Quiddity, QuimGil, DannyH and 5 others. Arlolra added subscribers: Walkerma, Tim-moody, Bzg, unleashkids. Arlolra added subscribers: Ironholds, Krinkle, jayvdb. Arlolra added subscribers: • Jaredzimmerman-WMF, PEarleyWMF, Anomie and 3 others. Arlolra added a subscriber: • MNguyen. Arlolra closed this task as Resolved. Arlolra added subscribers: Legoktm, ShakespeareFan00, Dvorapa, Stashbot. Arlolra added subscribers: Niedzielski, jhsoby, Dbrant. Just want to confirm that thx to this work we have been able to support video/audio in ZIM files for Kiwix.